Hey all, these are all of my likes of July! Enjoy! First, I want to talk about a mascara. This is Maxfactor's Clump Defy which is the same as the Covergirl Clump crusher if you are in the US or elsewhere. I really love this mascara and I never get any clumps in it. It's very buildable and you can start with a light natural effect or build it up to big bold lashes. 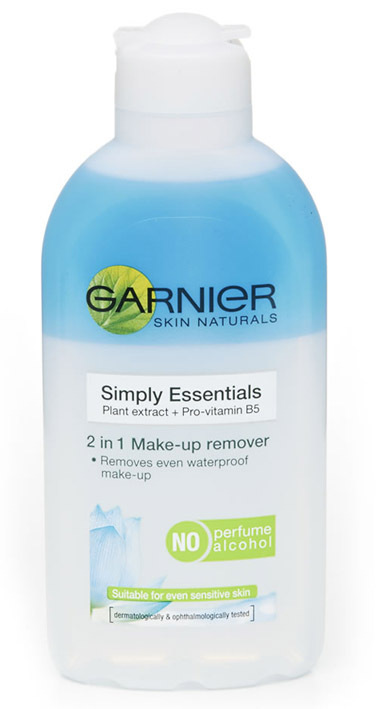 My skincare favourite will have to be Garnier's 2 in 1 Makeup remover. I think this is meant mainly for eyes but I use it on my face as well and it is amazing for clearing up my skin. I have a major issue with blackheads and this product leaves a lovely residue on your skin which feels moisturising and smooth but it also clears up my blackheads within minutes. I know this sounds hard to believe but it reduces them so much. However it doesn't last, if I take my makeup off at night I still will have blackheads when I wake up but it's perfect to use before a night out to clear your skin for the evening. Oh and it's also amazing at taking off makeup. Moving on to fashion favourites, my hippy sunglasses from Topshop are my new Summer staple. They are so retro and cute and I have a baby face which means it's hard to find Sunglasses which suit me but I love these and I where them all the time; if you've seen my OOTD posts you will know. Next, my other newfound Summer staple - bandannas! If you know me I am practically famous for my messy buns (I literally have my hair like that 70% of the time) and these are the perfect thing to spice them up a bit. I bought one in NY from Madewell (the top one) and I was hooked from then onward. I was also giving away some old toys and as a child I would wrap little scarves around teddies as dresses so when I was clearing some out, I found many bandannas in the process. These are my favourites. This past month, me and my friends have been getting together and making custom T shirts using iron transfer paper and Tie dye. I ordered a whole bunch of plain white tees from Amazon really cheaply and then my friends and I printed out cute pictures or pictures of our favourite bands and put them on the T shirts. We also added cutouts, tie dye and fringe too! Below is one I made with a picture of a Unicorn crossing sign which I think is SO cool. Next I have a pair of shoes which are my Tom dupes from the Next men's section (I got a small size) which I have worn everyday for the past month! They are so comfortable and they match with everything. Alongside these I have my beloved Wave board. I was given this three or four years ago and never used it but on the first day of Summer, I pulled it out and taught myself. My board is the Ripple which is a smaller version of the original Wave, designed for sharper turns and smaller movements which is perfect because I use it on my patio area in my garden which is fairly small and this maneuvers around flower pots and garden chairs very well. I ride this multiple times a day, whenever I'm bored or in the garden. It works by moving your hips and legs and is actually not a bad workout because it uses your stomach muscles too. My brother has the larger version and I like using that sometimes too but I found it easier to learn on the Ripple. My two book favourites are Torn by Cat Clark and a journal-type book called Q&A a day. Firstly, Torn is amazing and probably the saddest book I've ever read. I actually started and finished it on my flight to New York, so in about 6 hours. Once you pick it up you HAVE to get to the end and find out more. I won't give anything away but I don't think the blurb is very good so I will do my own. It's about a group of teenage girls who go on a school trip together. It's based on stereotypical ideas to begin with, as you have the mean popular girl, the emo and the nice girl and the sporty girl. The girls want to play a prank on the mean girl to get back at her for all the things she's said and done but the prank goes too far and horribly wrong and something drastic happens. The girls then live with the guilt and each slowly go insane in a different way. As you can see it's quite a dark book but definitely a must read. Q&A a day is just what is says. You answer a different question on each day for five years and you can see how your answers change overtime. For example, one question is 'Do you think people can change' on the 1st of July. Each year you answer that same question on the 1st of July and see if your answers change. It's a really quick thing to do and I keep it by my bed so I do it just before I go to sleep. Finally I have my crafty project of the month. This my friends is a Kusudama: a Japanese medicine ball, except this one is made out of origami instead of herbs. It's from a kit you can buy here and it took me a few hours to make but it was really fun and there's something about late night origami that's really relaxing. It's hanging in my room and I'm very proud of it. If you guys try it, tweet me a picture to @lexi_likes or tag me in an instagram @lexi_law .